CONGRATS (USA) (Bay 2000-Stud 2007). 7 wins-1 at 2, Santa Anita San Pasqual H., Gr.2. Sire of 695 rnrs, 458 wnrs, 26 SW, inc. Turbulent Descent (Hollywood Starlet S., Gr.1), Haveyougoneaway, Emma's Encore, Wickedly Perfect, Forever Darling, Venus Valentine, Polar River, Jacaranda, Cash Back, Check My Cheeks, I'm Steppin' it Up, Nora's Cat, Portside, Pat on the Back, Miss Mo Kelly, Pangburn, Temper Mint Patty, Cougarville, Flutterby, etc. Southern Icon (g. by Big Brown). 7 wins-1 at 2-to 1400m, NZ$112,790, to 2015-16, Hawkes Bay Fastrackinsurance HB Autumn H., Waikato RC Group 1 Turf Bar H., Taumarunui RC Cal Isuzu S., Hawkes Bay Brokerweb Risk Services H., Manawatu RC Ricoh H., Waikato RC Sacred Falls H., 3d Waikato RC Allied Security H., Hawkes Bay Stella Artois H.
Super Eighty Eight (g. by Sebring). 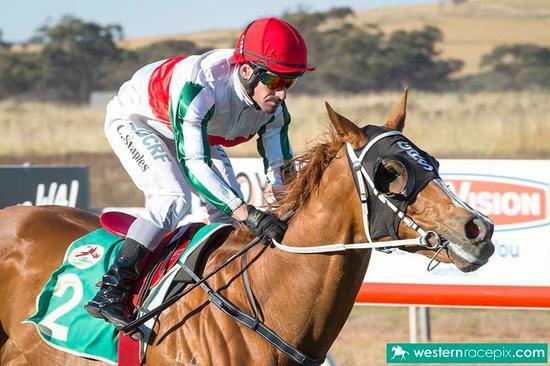 2 wins-1 at 2-at 1000m, 1200m, WATC Westspeed Nursery H., Autumn Racing H., 2d WATC Seacorp H., Imagesource Digital Printing H., 3d WATC Tabtouch.com.au H., Club Volunteers H.
Forty Four Red (g. by Congrats). 2 wins. See below. Meliboea (f. by Sebring). Placed at 2 in 2016-17, 3d ATC Newgate Sizzling 2YO H.
New York Philly (f. by Manhattan Rain). Placed at 3 in 2016-17 in Aust. GREENE STREET (Zabeel). 12 wins from 1400m to 2200m, NZ$404,975, Avondale Gold Cup, Gr.1, Waikato RC International S., Gr.1, Hawke's Bay Cup, Gr.2, Taranaki Cup, Gr.2, Manawatu RC Crombie Lockwood Insurance Brokers H., Waikato RC Babich Wines H., Counties RC Franklin Long Roofing H., Hawkes Bay Add Impact Signs H., WRC Radio Pacific 711 AM H., 2d ARC New Zealand S., Gr.1, Avondale JC Mondiale Freight Services H., WRC Cup Trial, Marton JC Rangitikei Tavern-TAB H., Otaki Maori RC Wellington Guineas Trial, Waikato RC Diamond & Time Jewellers H., 3d WRC Trentham S., Gr.3, Taranaki Cup, Gr.3, 4th Waikato RC International S., Gr.1, Hawke's Bay Cup, Gr.2, Manawatu RC Awapuni Gold Cup, Gr.2. CATECLIPSE (Catbird). 8 wins-1 at 2-from 1100m to 2000m, US$5,540, A$421,700, AJC Craven P., Gr.3, Samsung Welter H., Korea Racing Association Trophy H., STC Ron Coote & Noel Kelly H., Bowlers Club Welter H., Bacardi Breezer Welter H., Primmcoy City of Sydney RSL 2YO H., Matt Behrmann Bookmaker H., 2d AJC Emirates Airline P.H., Corrida H., Empyrean H., 3d Hawkesbury Gold Cup, Gr.3. Capability. Winner at 1650m, HKJC Oceania H., 2d HKJC Sutherland H., Morse Park H., Pacific Ocean H., 3d HKJC Red Packet H., Wo Che H.
Another Bachelor. Winner at 1600m, 3d Marton JC Coombe Smith Rangitikei Ltd H.
Take Five. 3 wins from 1600m to 2000m, SAJC BMW 5 Series H., 2d HBJC Computerland Juvenile H.
Starwatching. 2 wins at 1400m in Aust. Sidestepper. Winner at 1200m in Aust. Aerion. Winner at 1400m in NZ. Solo Saga. 3 wins-1 at 2-from 900m to 2100m, A$103,005, BRC Rice Naughton Family Law H., 2d BRC Fujitsu General H., RML Logic Pty Ltd H., Madison Cleaning H.
Nujooloo Road. 7 wins from 1200m to 1900m, BRC Hidden Dragon P.
Kokanee Bay. Winner at 1000m, 2d WATC DBR Computing Solutions H.
Decieboy (Decies). 6 wins-1 at 2-from 1200m to 2200m, Vincent Jockey Club Centennial H., Otago RC Brighton H., 3d Otago RC Dunedin Guineas, L.
STARGAZER (Star Way). 9 wins-2 at 2-from 1300m to 2250m, A$882,830, AJC Frank Packer P., Gr.2, NSW Tatt's RC Chelmsford S., Gr.2-twice, QTC Grand Prix S., Gr.2, STC Gloaming S., Gr.2, 2d AJC Spring Champion S., Gr.1, QTC Castlemaine S.H., Gr.1, STC Rosehill Guineas, Gr.1, 3d AJC George Main S., Gr.1. Sire. GIRL GONE ROCKIN' (Redoute's Choice). 4 wins from 1400m to 2050m, A$291,080, VRC Matriarch S., Gr.2, MVRC Melbourne Neonatal Network H., 2d ATC Cornucopia Committee Inc H., MVRC Corporate Interiors Australia H., Adapt Australia H., 3d MRC Sportingbet H.
SYREON (Flying Spur). 6 wins from 1300m to 2000m, A$437,700, ATC Queen's Cup, Gr.3, AJC Belmura Lad H., 3d ATC Queen Elizabeth S., Gr.1, Sky High S., L.
KAP THE BID (Kaapstad). 11 wins from 1400m to 2000m, NZ$98,425, CJC Great Easter S.H., L, 2d CJC Challenge S.H., Gr.3. ISIBAEVA (Johannesburg). 11 wins to 1400m, A$287,560, TRC Bow Mistress Trophy, Gr.3, Sorell Plaza Shopping Centre H., 3d TTC Vamos S., Gr.3, Newmarket H., L.
Race Record: 15 Starts 2-3-1 A$35,362. 2 wins at 1300m, 1400m to 2016-17, 3d WATC Colours Summer Special H.